Some people misunderstood the intent of my last post. It was certainly condescending toward the "thieving" artist. But it was not in a sanctimonious-dean-accusing-a-student-of-plagiarism way, but in an experienced-thief-shaking-his-head-at-the-burglar-caught-by-leaving-tracks-in-the-snow kind of way. Because let's face it: all artists are thieves, if you count being influenced by images or ideas that you didn't create as stealing*. So it's not "good artists borrow and great artists steal"; it's good artists clumsily pick-pocket, and great artists pull off the heist of the century. Great artists steal in ways that are either untraceable or in ways that are so masterful that nobody cares where it all came from. So while I'm not one of the all-time great plunderers, for the sake of other bungling burglars out there I'd like to share the ways I've learned that you can steal and still "get away with it." Otherwise known as "using reference," this is the most fundamental grab-and-run operation. It consists of drawing or painting something that already exists, usually while the artist is looking directly at that thing. Sometimes the artist will set up a scene and then pilfer it verbatim, but other times he or she will pinch from smaller photos or art that describe the individual elements needed for the larger piece. Similar to the Lookie Loo, but in this case the artist steals imagery or ideas from things he or she has seen or been inspired by in the past. The beauty of this ploy is that the artist may perform the theft without even realizing it is happening. In order to avoid a surprise outcome with the Memory Game, artists may intentionally throw in a Combination Caper or layer in a Romance Scam to throw people off the scent. Here the artist lifts multiple ideas from different sources and fuses them together. The success of this caper relies on constructing an image from things the audience is already familiar with, so that they will subconsciously register each contribution as it influences their reaction to the piece. Otherwise known as "quoting," in the Parrot Ruse the artist repeats a recognizable portion of another artists' work in order to establish context for his own message. 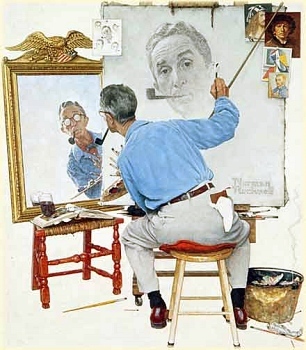 By calling upon the viewers' familiarity with the work being quoted, the artist suckers them into thinking that his wholesale rip-off is acceptable because "it's ironic." The non-art equivalent to this would be stealing a Lambourghini in broad daylight while singing. Not only would people allow it: they would applaud afterward, assuming the theft was a clever part of a flash-mob. Sure, the artist's character design isn't that original. But when everyone is looking at the way she's handled the lighting, or the emotional expression of the piece, most people don't even think about the design. The Romance scam works by misdirection---the artist hides her fraud in one area with fancy execution in another. This is one case in which an artist can get away with taking other art or photos directly, if it is done carefully. 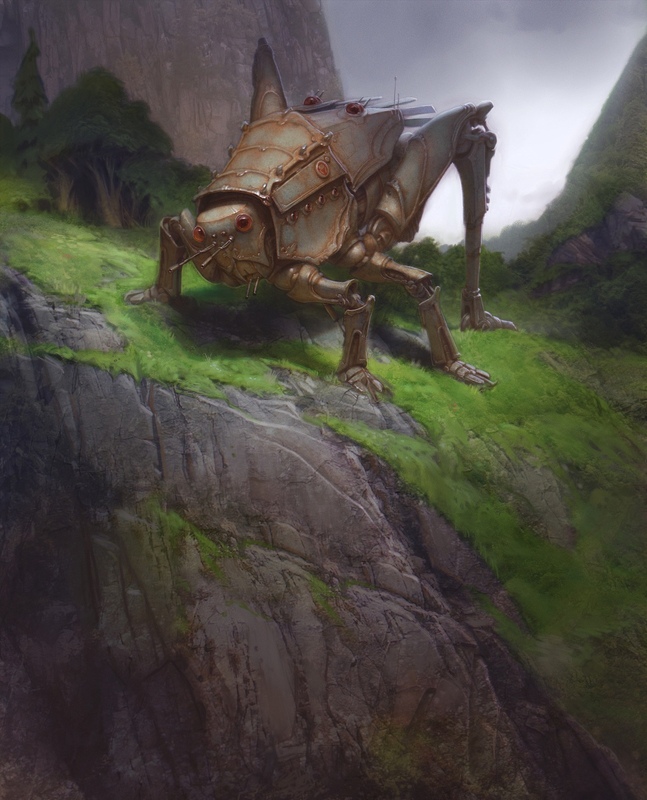 By layering in textures, patterns, or other effects from another source, the artist can quickly add polish and something interesting to his piece. This type of cheat only works when nobody recognizes the source being used, or if some combination of the sources creates an effect that masks the individuality of the plundered pieces. Think of it as a collage of crime. This one is commonly used by digital matte painters, who need to create a sense of realism, but do not have the time or inclination to paint in every leaf on every tree. In order to pull off a Chop Shop successfully, the artist has to know something about composition and how to get things to fit together. The artist's primary goal in a Chop Shop job is assembling his ill-gotten goods in an appealing way. Don't have any original ideas? Just vandalize one of your lifted ideas with some crazy effect and call it "modern." This lowbrow version of the Romance Scam appeals to people's fear of being considered less intelligent than others. Just be aware that, even if your lengthy essay explaining the piece impresses your art school buddies, you can't expect to win any points in accomplished art crook circles. It's a small-time scam and we've all tried it at least once, but the real satisfaction is found in bigger heists. Selling a product made by someone else as your own? We all know that direct copies and studies have value to you personally, but don't try to profit from them unless your big dreams as an artist include being blackballed by at least a corner of the industry. This is when the artist decides that, since nothing is original anyway, he or she will just paint the same boring things as everyone else and not ever even attempt to have an original thought. Mastering a technique, but not developing the ideas beyond stage one, is just a waste of potential. *Disclaimer: I'm not condoning actual art theft, of the literal or figurative variety. In fact, I don't believe artists are thieves any more than I believe that artists are accountants. I DO believe in relaxing a little and appreciating the fact that all artists are standing on the shoulders of giants. Please don't begrudge another artist if they are standing on your shoulders; because you've enjoyed the same courtesy from other artists around the world and throughout history. LOL. Either my post was just TOTALLY offensive. Or you took it down to spare me the embarrassment. 'Cause I CERTAINLY MISSED THE POINT. Just shoot the horse, dear. Old gray mare, probably could use the exit. Now I'm going to read this one understanding the point. Then I'm going to go hide in the closet. Actually, your comment was great! I have no idea how it got deleted, probably a Blogger problem. I've been having a lot of those recently. My wife tells me that lots of people were complaining about deleted comments after the latest blogger maintenance, so maybe that's what it was. I don't ever delete comments, unless they're spam. So your thoughts are always welcome, unless they have something to do with me buying shoes or viagra. But you got to read it, right? Because that was the point. Even though I missed it. The point. I should sue them for censoring me. HA! Yep, I got to read it. I liked reading your examples showing the difficulty prosecuting creative theft. And I think you're right that the infraction would have to be really blatant to be even worth pursuing for that reason. ummm - there were naked women in there. Influence is one thing - but when you take someone else's characters or intent and do something - that goes in a direction that would wound, that's another thing. Or if you take something someone else is going to use and get in there first and make money off their idea without permission, then you are scum. No way around that. Rug stealing, name stealing, character stealing - scummy. Shorter. More to the point. So there. Or, Aughou! (which, naturally, auto-corrects to "wiggly"). Hopefully you don't delete that last comment because it mentions Viagra. I'll try steer clear of your forbidden subjects in the future. I'm sure you'd do the same if you were in my sh . . . Blast! Very good article and it really helped your point using the visual examples. I do think your small footnote should be more part of the overall article and given more importance. Hahaha! this is hilarious. I love the heist analogy, I totally get it. I'm trying to improve at "The Memory Game", it's the best heist in my opinion. but to get good at it, an artist has to do a lot of behind the scenes practice heists (like plein air and anatomy studies). It's like Ocean's Eleven, where the crew plan out the everything, worked out all the kinks, then when it came time for the big hit, the whole thing goes down smoothly and everyone is like "HOW THE HELL DID THEY DO THAT?" I think a lot of us artists want that kind of reaction when people look at our work. It's kinda funny to think about it in this way. I'll have to remember these. Laurence: I was thinking of doing that originally, but I think a list of art heists is more fun to read than a preachy footnote. LouB: That's a great example. I want to do an Ocean's 11-grade painting one of these days. 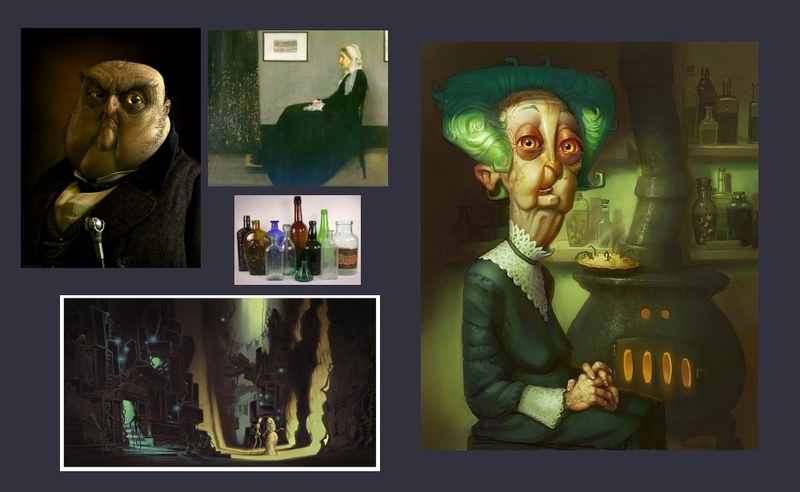 I put that image in the Combination Caper section, but it was actually a memory game---I thought I had the original idea of doing an old lady with owl eyes, but then I later found his image in my reference folder. It just stuck in my head and came out later as an idea without me realizing it. Yes, I understand, at me happened such. I think it absolutely normally. You make an interesting point. When I saw your first post my thoughts were that this artist either didn't mean to be so obvious or he was following a insistent art director. I'm glad you see it all this way, its the best way I think. And your descriptions of theft type are awesome, II wish they could be used to make a game or something! I think such a post is definitely important and should be part of every proper art education. The problem I see is that it doesn´t help anything when artists who do need to pull out magic of their heads every day have to deny these methods to get food on the table, while any photoshopping teens trying to impress their peers think they can do just this, because they were not educated. In my opinion the main problem lies in the education itself, copyright shouldn´t be a specific discipline, it should be a primary discipline like math, this would save any industry millions of dollars a year. But on the other hand I forgot, lawyers and courts do need that money oh so well, so its better to let children uneducated and infringe copyright and learn that piracy is OK so that they are sure to be victims sooner or later. I live by the important rule, (I believe Bruce Lee coined it): "Learn the rules, so you know how you can break them properly." Fantasio: I think there's a lot of truth to what you're saying. In my school they were anti-plagiarism of course, but they were also anti-cliche---so much so that students sometimes chose to do something weird over something familiar and appealing. I get why they push so hard to avoid cliche, but I do wish they'd spend more effort teaching what that means for appealing art and story. Conzpiracy: Interesting article, thanks for the link! This is a great post, i find myself doing the same things. Is there any other books or articles on the matter you may have found relative to the same subject?